The fate of the Fair and the market lay ultimately in the hands of the council’s General Purposes Committee, working in close conjunction with the Markets and Fairs Committee. 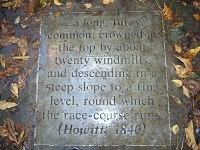 And despite opposition from many members of the Markets and Fairs Committee, the two committees agreed in July 1927 that grand scheme for the marketplace – to include fountains and T. Cecil Howitt’s proposed processional way (Howitt, who worked in the council’s City Engineers Department, was the architect commissioned to design the prestigious new Exchange building) – would mean there was no longer room for the old market stalls. While the future of the market was now problematic, the fate of Goose Fair was still unclear. In mid-September 1927 the Evening Post was still reassuring its readers that that moving the fair was unimaginable while acknowledging that its current location was, in many ways, unsuitable. Nevertheless, the article went on to reassure ‘the great section of the public which eagerly awaits the advent of the fair’ that the 1927 Fair would not differ substantially from previous years apart from a couple of changes. First, a John Collins roundabout that was normally situated towards the upper end of Wheeler Gate was to be replaced by a newer roundabout owned by ‘Nottingham showwoman, Mrs Mellors’. Second, there were to be fewer games due to the removal of the gaming area that had in previous years run up both King Street and Queen Street. This latter change was a result of the upheaval wrought by the introduction of a trolley bus network which was to run along Nottingham Road and terminate in the vicinity of King Street and Queen Street. The article admits it unlikely any new amusements would feature in the future fair so long as it remained in the Marketplace since there was no further space available. The article goes on to note that such limitations ‘may be held by some people to be an argument for the migration of the fair… to a more commodious site’ and that removal of the fair to a larger site would improve the fair by allowing a ‘large number of contrivances at big seaside resorts’ to be included whereas there had been a noticeable decline in novel amusements in ‘recent years’ of Goose Fair. On Sunday 2 October, the weekend prior to the opening of the 1927 Fair, a crowd of some twelve thousand protesters gathered in the marketplace in front of the half-built Council House to petition against the fair’s removal. Pat Collins, President of the Showman’s Guild, was among the petitioners. 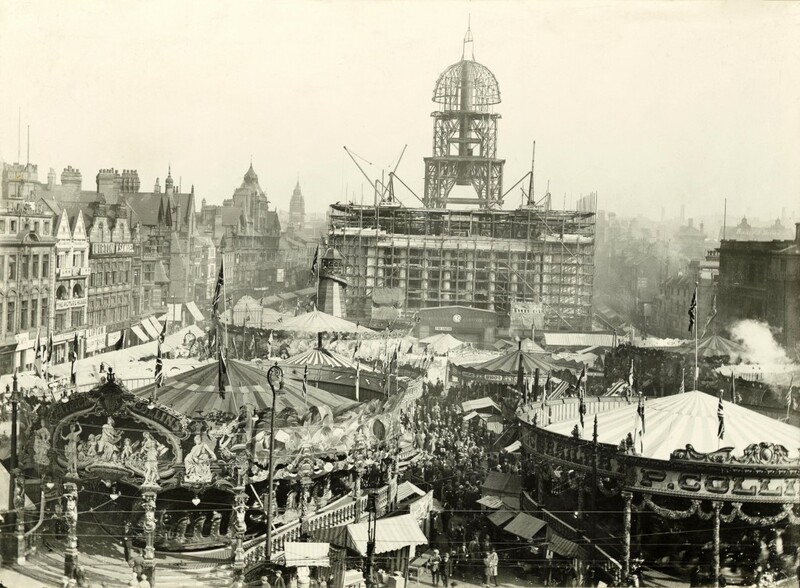 Four days later, the Fair opened and the front page of the Evening Post claimed: “This is not the last market place Goose Fair”; indeed, the Mayor insisted that the Fair would be back in the Great Marketplace in 1928. Shortly afterwards, in October 1927, a decision was taken to house the markets’ stalls within a new purpose-built covered market building on King Edward Street. In November 1927, a joint meeting of the General Purposes Committee and the Markets and Fairs Committee discussed proposals for the new marketplace layout. It soon became clear that if the marketplace was redesigned according to Howitt’s plans it would wholly unsuitable for hosting Goose Fair. The idea of moving the Fair to another location was discussed and deferred to the City Engineer and Clerk of Markets, who were to compile a report by 16 December on potential alternative sites, taking into account such particulars as: water supply, lavatories, accommodation and transport. It was only in spring 1928 that a joint meeting of the two committees finally debated possible alternative locations for siting Goose Fair. London Road “near the cattle market” and the Forest “Noel Street side” were proposed and a recommendation made to transfer the Fair to the Forest. It was concluded that the Noel Street side of the Forest was the best alternative. First, it was twice the area of the marketplace. Second, it had good transport links, including the then LNER railway station at Carrington, an existing bus route via Noel Street as well as a tramcar route nearby. Third, there was also room for a car park to encourage the growing number of motorists. Both committees “strongly recommended this site”. The matter of when the move would take place was put to a vote: should it be 1928 or 1929? Alderman Pendleton and Sir Bernard Wright of the General Purposes Committee were anxious to proceed with the proposed layout as soon as possible so that the new marketplace unveiled at the same time as the New Exchange building. Others, however, sought to delay the move of the Fair until 1929. The proposal to move the fair in that same year, 1928, was put to the vote ‘and was carried’ by 34 to 17. The Markets and Fairs Committee included the Lord Mayor, whose public assurances about the fair had come to naught. On 16 May 1928, the Markets and Fairs Committee met and discussion included how interest might be drummed up for the Fair’s re-launch on the Forest. The committee members were unsure how much interest the re-launched Fair would attract from showmen and were genuinely fearful that the transfer of the Fair from the Great Marketplace to the Forest might spell the end of Goose Fair. Thus it was proposed that advertisements be posted. The committee also decided to reduce the rents in the first year, to further entice prospective showmen. A 50% reduction was initially considered but rejected as too generous and ‘a dangerous precedent’; the committee thus settled on a 35% reduction. A sub-committee of the Markets and Fairs Committee was to be set up at which the showmen would be invited to air their views and suggestions about the forthcoming changes. Among the suggestions made was an appeal by G W Jackson of The Bell Inn for stall space and a temporary three day licence for ‘intoxicating liquors’ but this was rejected: no alcohol was to be sold at the Fair. As October 1928 approached, and the launch of the new Goose Fair on the Forest became imminent, the Markets and Fairs Committee and the General Purposes Committee began engaging with the minutiae of forthcoming arrangements. For example, a meeting in June 1928 explored the complaint from a Dr Horgan concerning the “cutting down of plantation” in order to accommodate the lavatories for the Fair on Noel Street. Horgan’s claim was dismissed, with the Town Clerk noting that “no suggestion had been made to interfere with plantation” and that the lavatories would be “only of a temporary nature”. But Goose Fair was not the only fair with which committees concerned themselves. Smaller fairs at Easter and Whitsuntide were also held annually in the Great Marketplace. These were smaller fairs and it is was decided that they could remain in the marketplace.